Now before I start with the fashion, I wanted to point out a feature in Firestorm that I have only just seen in the Beta viewer for the first time. 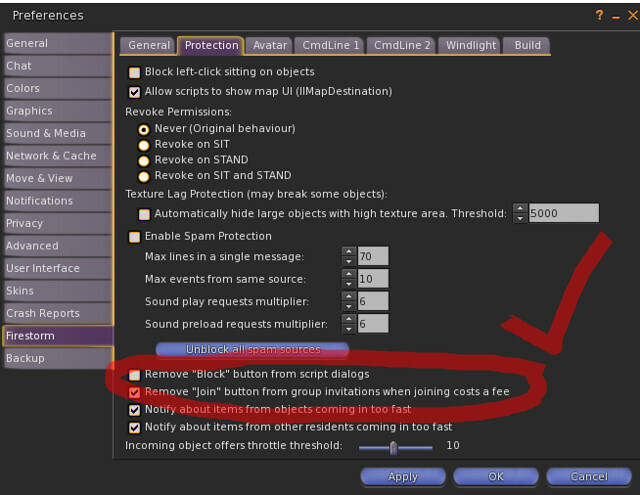 This may not be new, or it may only be in the beta, and a planned option, but if not look for it, because it is probably one of the most important options in there. You can see from the image where it is in preferences (Ctrl P) and it will ensure that no scammers can con you out of your lindens. During this years Hair Fair and reportedly other events in the past few months, people have made groups that charge a few hundred lindens to join. They are spamming people at laggy events with them, so when the person is trying to remove the invites, or accept items they have purchased, they can end up losing money. So please for your own sake check the box, and don’t let them take advantage, and tell everyone you know to do this too. I fell instantly in love with the Lulu dress from The Secret Store, its vintage beauty and incredible meshwork, makes it stand out in a crowd. The style is a combination of I love Lucy and Stepford Wives ( the original ) with a little Bewitched thrown in for good measure. I especially love the richness of the brown and white combination, it is such a charming frock that you will feel all feminine and beautiful, with a little skip in your step as you enjoy the day. The hair from Lelutka – a recent release – just adds to the charm. This style comes in two pieces, which can be added to with the help of a hairbase if you prefer. The ribbon comes with and is worn as an add on attachment, and has texture change menu options. There is also a gorgeous pearl and diamond tiara, that can make you a perfect Princess, or can do for a formal or wedding type event. Just so elegant. Slipping my slink feet into the perfect Mila flats by Ingenue, just made the perfect sunday look for me – yes it is sunday already down under – I was definitely delighted that the brown in the shoes matched so well with the dress, and the peeptoe front just accentuates the vintage charm. Speaking of shoes, Shoetopia is coming up fast, and I cannot wait. The event is a huge undertaking and will be a pleasure to attend. the event is going to be raising donations for Soles 4 Souls and it starts on the 15th of November, so start saving up, because there are going to be some incredible footwear must haves all over the place…two sims full to be exact.